2.2 What does all this mean to me? You have teammates who can help you in your engagements, and whom you can help in theirs. This means you don't have to attack the guy directly in front of you; it's often more productive to attack the one in front of the ally next to you. This increases your strength as per the Square Law, and can allow for combined arms tactics involving multiple unit types even if either you or your ally have been making only one or two unit types yourselves. Unlike other RTS games, scouting here is very important, as it stops you wasting units and allows you to prepare for a fight, or kill a small enemy group before they are ready. Using advanced radar or simple radar is a way of scouting,but sight via units is more accurate as it doesn't have radar wobble. Those that cloak (Infiltrator/Flea) are better as they are invisible and can close up on an enemy base and not be spotted. It's no secret that a big army stands a good chance of beating a smaller army. However, the larger force's advantage can be a lot bigger than you think. "Wrong!" said Frederick William Lanchester, a British engineer and mathematician who lived from the middle 19th century through the end of World War II. In 1916, Lanchester devised a series of differential equations to demonstrate the power relationships between opposing forces. Among these were Lanchester's Linear Law (applicable to ancient combat, where engagements on the individual level were purely one-on-one), and Lanchester's Square Law (for modern combat, where multiple individuals can attack a single target). It is the square law that concerns us here in ZK. According to the square law, the relative strength of two forces is given by the ratio of the squares of their relative numbers. Thus, while two Stumpies are four times as strong as one, four Stumpies are sixteen times as strong as one. Note that the Square Law does not apply to multiple weak units against a single strong unit: for a lone tank A to be able to compete with four opposing B-tanks, tank A needs to be qualitatively four times better (four times damage, four times HP) than an individual tank B. The Square Law is why ten Minotaurs take a lot less than 50% losses when squaring off against five Minotaurs. Limitations to simultaneous engagement. Due to constraints such as range, there is a limit to how many units in a force can engage the enemy at a given time. While both sides are at this limit, the battle will tend to follow the Linear Law; the attrition rate will be based on the linear ratio of combatants currently engaged (unity if the same number of units on both sides can fire at any given moment). Since more expensive units have longer range and higher density, they have a higher engagement limit (ie. more of your metal goes to shooting rather than sitting around) and can thus gain the upper hand over swarmers in choked conditions. AoE weapons. While the Square Law assumes that any individual unit may only fire upon one target at a time, many riot units in ZK have AoE weapons that allow multiple units to be damaged at once. As a result, they tend to do several times more damage to large groups of small units than to smaller, more dispersed groups, or larger units (where usually only one unit at a time takes significant damage, as opposed to several for the swarm). Weightclass and attrition. Because a ZK unit retains full firepower until the moment of death, a group of small units can lose strength over time due to attrition while a single large unit does not. However, as the number of combatants involved increases, the weightclass advantage diminishes as both sides suffer attrition at increasingly equal rates. Focus fire - it's how the law works, after all. The more enemy units you destroy, the bigger your advantage gets. Pool your forces, including with allies. Even a few extra units can really tilt the battle in your favor. By creating local superiority during battles, you can even overcome an enemy who has more forces on the global level. Formate your units. A good formation allows more of your boys to be shooting theirs at once; even if this advantage lasts for only a few seconds, it can significantly affect the outcome of a battle. Moreover, the less clumped your units are, the less AoE weapons can hurt them. Always try to have a line or encirclement formation when joining battle. Don't have metal in your storage. When even one tank makes a difference, it goes without saying that you want as many units as you can possibly get. This is more a philosophy of how you should be playing, but if you want to be better at the game, one of the key principles is just to be aggressive. It's a war game, so fight! Put simply, you cannot win by defending. The only way you'll ever win by defending is boring the enemy to death. You'll have to attack eventually, so why not attack now instead of later? Sure, later you'll have more units and economy, but so will he. But, attacking is also a sound economic decision. Metal is the most important resource. The only way to get metal is to expand and take Metal Extractors, or to fight the enemy and reclaim their wrecks. Thus, metal is territorial- you must always be trying to gain territory from the enemy to get more metal. This means aggression. If you build a lot of energy structures to overdrive your mexes it gives you no advantage- the enemy can do the same thing, and will do so faster if he is more aggressive about taking mexes. Take the situation of a 4v4. On one team, 3 players fight, one builds economic structures. On the other, all 4 fight. Given equal skill, the 4 fighting players will win- they will take more territory, more metal spots, and when they destroy their enemies they will get to reclaim all the wrecks (both from their own dead units, and the enemies). All it takes is 1 commander wreck and they have a huge economic lead- probably much more than the player who goes pure economy, while having wiped out all his allies. What if all players from team 1 porc defences, and on team 2 they attack all out? Even assuming team 1 manage to take at least half the map (which, given a less offensive approach, is unlikely) an intelligent team 2 will see the amount of defenses they have, and know that this means less offensive units. Having the advantage in offensive units mean they need not fear attack from the enemy- they have more mobiles and can thus always beat him even with only token static defense. Team 2 can spend the rest on economy consolidation, much more than the players who are devoting their resources to defenses. Even though static defences are, on average, 2.5x as cost-effective as mobile units they must be spread thin over a larger area. This means an attacker can concentrate his forces on a single point in the defensive line (perhaps softening it with an artillery barrage), taking on only a fraction of the enemies turrets while the rest of the defensive structures sit idle and useless. So attack. It's the only way to win. Defense structures in ZK are generally a match for twice their cost in mobiles. This, along with the simplicity of managing them, makes it tempting for players (not all of whom are new) to use them a lot (not just in turtling without expansion, but also during confrontations after boundary lines have been drawn). It goes without saying that this is a Very Bad Idea™ indeed. Mobile units being, well, mobile, means that they can gather in a single area (namely, where the action is happening), while statics, being rooted to one spot, must be spread evenly across the defensive perimeter. This means that attackers can easily achieve local net superiority over a static-reliant defense, resulting in a line of useless d-fenz and a breach in the line - and that's before we discuss the effects of artillery against statics. In contrast, mobiles can respond to an attack at any point, relying on the few local statics to give them the small but crucial net advantage over the enemy. Therefore, a better player will concentrate defense only at key points and sprinkle it over the rest of his/her perimeter, relying primarily on mobiles for defense. But is there an even more effective way? Yes, the best way to resolve the problem of static vs mobile defense is to leave the question to your opponent. By attacking, you force the enemy into a defensive posture, forcing them to spend more on defense while you have to spend less. With more resources for mobiles, you can contest mex spots and wrecks more effectively, resulting in an even greater resource advantage. Additionally, the psychological pressure will make your opponent more prone to making mistakes, which you can exploit effectively to create a similarly vicious cycle. 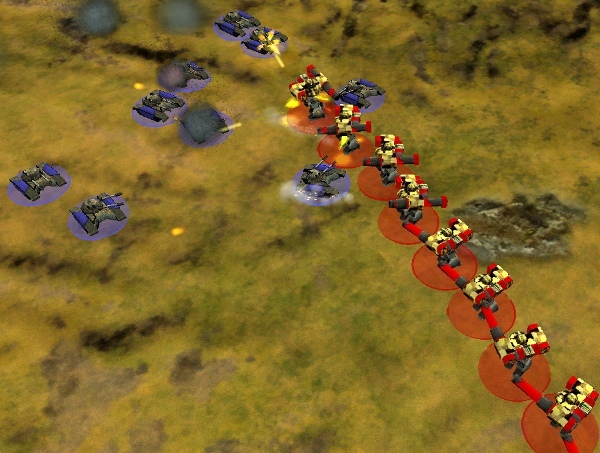 Most players know that most units (skirmishers in particular) do best in a line or encirclement formation, which allows the maximum amount of forward firepower. The best way to counter this is to run up beside the line, and then down the line (parallel to it). This move, known as crossing the T or enfilade, exploits the weakness of the line formation as units on the far end of the line will often be out of range and/or obstructed by friendly units further up the line. Frontal attacks on a line should be avoided whenever possible. This maneuver also works on static defenses, although open ends in the line to flank are generally less frequent and it's usually better to ignore the rest of the line and proceed straight to the base once the perimeter is breached. When a head-on assault on a defense line is called for, one trick to increasing your firepower is to mix some raiders with assault units. The assault units close in first to draw fire from enemy defenses, then the raiders move in for the kill with their superior DPS. In addition to increasing the odds of a successful breakthrough, this also makes a raider force immediately available to attack the enemy's logistics once the enemy's defense line has been penetrated. When you lose sight of your strategic goal, a thousand tactical victories shall amount to nothing. He who plays to achieve victory will accomplish it; he who plays to avoid defeat merely prolongs it. This page was last modified on 31 December 2017, at 14:16.